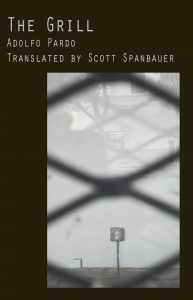 Scott Spanbauer’s The Grill is a translation of Adolfo Pardo’s La parrilla (1981), an unnerving depiction of state-sponsored terror in Chile during the dictatorship of Augusto Pinochet (1973-1990). Named after “the grill,” a torture device that uses electricity to force confessions from its victims, the story serves as a counter-narrative to the official discourses of the Pinochet regime by presenting an eye-witness account of the government’s tactics of intimidation, humiliation, and violence. The story is told from the point of view of an adolescent girl who is kidnapped, along with her brother, for her resistance to the Pinochet government and spends several days in a political prison. The two are subsequently beaten and tortured by the National Intelligence Center, a gestapo-like political police force responsible for an estimated 40,000 abductions, thousands of which resulted in torture, murder, and permanent disappearances. The new publication by Veliz Books (El Paso, TX) includes a copy of the story in English and Spanish, newspaper articles from events that took place during this period in Chile, and short introductory essays by Chilean writers, academics, and poets like Carlos Ortúzar, Diamela Eltit, and Raúl Zurita. In his introduction, Ortúzar, who wrote alongside Pardo during this period, explains that the story is the product of human rights abuses and an explosion of testimonial literature in Chile that documented the events taking place after Pinochet’s rise to power. Ortúzar writes that the story only survived because state authorities struggled to shut down modes of dissent like La parrilla, which was published clandestinely and distributed by hand to readers. Pardo, who still resides in Santiago, adds that the story is based on the experience of Gabriela Durand, who dared to tell him the story of her kidnapping, and Jaime Valenzuela, who financed and subsequently assumed the risks associated with the unauthorized publication of the book in the early 1980s. Much later they came back to take me off to the grill. They took off my handcuffs and ordered me to take off my clothes. I got undressed, got on the stretcher by myself, spread my legs without comment, they tied me, applied the current to me and I didn’t faint. I remember perfectly that they were asking me questions and applying current, nice and easy at the beginning, or maybe I just didn’t feel it anymore, exhausted by so many questions and fabrications. The objective and non-accusative tone of the narrator methodically walks the reader through each step associated with the grill without gratuitous violence or detail. Consequently, the story provides a meticulous representation of the events taking place in Pinochet’s political prisons without directly denouncing the regime or estheticizing its abhorrent practices. Also notable is the lack of names and context. The story begins when the girl is pulled from her bed while her house is ransacked by the secret police, and neither the narrator nor the reader is fully aware of what is going on: “After a while the redhead who seemed to be the boss, the one who gave instructions, arrived – stay here, you, walk over there, watch the old man. I got scared and practically started crying because right then my grandfather passed by escorted to the bathroom, holding his robe together, barefoot and wearing only one sock.” The story builds a pervasive lack of knowing by withholding any assurance about why the police have arrived, what they plan to do, and what the consequences ultimately will be. The grandfather, who is caught in his robe and wearing only one sock, adds a colorful but undeniably real example of the chaos and confusion surrounding the sudden intervention of a private space by a state authority. Such moments allow The Grill to transcend its specific political situation and invite larger reflections about the nature of power, human relations, and the effects of violence on men, women, and societies inside and outside the Spanish-speaking world. The translation is Spanbauer’s second work after Calling Water by its Name, a translation of the Uruguayan poet Laura Cesarco Eglin’s book of poems Llamar al agua por su nombre. Spanbauer lived in Santiago, Chile during the same years the story was written and published, and his experience and skill are evinced in his thoughtful translation of dialogues rich in slang and expressions that are uniquely Chilean. Words like pololo (boyfiend), carabinero (a member of the national police), huevón (idiot), hueviar (to screw around), and huevada (nonsense) receive English equivalents that maintain the creativity and irreverence of their original meanings. Consequently, unsettling conversations between the teenage narrator and her captors during moments of interrogation, physical torture, and sexual humiliation read smoothly in colloquial North American English and invite readers not only to imagine how such scenarios might unfold in their own language but perhaps in their own country. The translation also captures the nuances of a division among young Chileans who had chosen to support the resistance or the dictatorship. Educated and free-thinking individuals were castigated for their expressed skepticism toward unquestionable authority while others obtained power and privilege for their loyalty. Additionally, the story details the inhumanity of those who sided with Pinochet and the regime’s modes of combatting resistance. More than physical beatings and the grill, encounters in the prison between the narrator and the young men in uniform reveal how the state used the sexual curiosity and depravity of male adolescents as one of its most potent tools of terror. It is a reality where classmates sell out other classmates, sisters are forced to give up their brothers, and everyday people are invited to wonder, under the right conditions, who among their friends would stand beside them and who would be operating the grill. Spanbauer’s translation captures a simple but profoundly disconcerting idea for 21st-century readers in the United States: terror is not always an international phenomenon. Mark Pleiss is a writer, researcher, and teacher in Denver, CO. He completed a Ph.D. in Contemporary Spanish Literature from the University of Colorado – Boulder and has taught courses on Spanish language, literature, and culture. He has published scholarly criticism and reviews in academic and non-academic journals and websites, and he recently completed an unpublished collection of short stories, Snipe Hunting, and Other Stories of Baxter County, which explores the culture and folklore of the American Midwest. He is from Omaha, NE.